This FAQ relates to the full TDM release version only. For players of the pre-release demos such as Thief's Den and Tears of Saint Lucia please refer to the Demo FAQ. 1 What do I need to play The Dark Mod? 2.1 Which Operating Systems are supported? 2.4 Does it run in Linux? 2.5 Does it run in 64 Bit Linux? 2.7 What about Ubuntu 8.10? 2.9 Does it run on Mac OS X? 3.1 Does TDM support widescreen resolutions? 3.1.1 What about TV resolutions like 1360x768? 3.1.2 Changing the screen resolution/aspect ratio does nothing!? 3.3.2 Disable Nvidia "Threaded Optimizations"
4.1 The game is very slow! What do I need to play The Dark Mod? With the release of TDM 2.0, you no longer need Doom 3 installed. The Dark Mod is completely standalone (and free!). You need only follow the installation instructions on the website to start playing the game. Windows, Mac os and several Linux Distribtutions are supported. Which Windows versions can I use? The following versions of windows have been tested and are known to work: Windows 2000, Windows XP, Windows Vista, Windows 7, Windows 8, Windows Server 2008, Windows Server 2003 in both 32bit and 64bit flavours. Many users (including myself) have reported that TDM runs well under Windows 10. Like Windows 8\8.1 there have been some problems with the darkmod folder preventing updates due to OS protections. Most users can bypass these problems by changing security settings on the folder. Windows 10 has added some granular security options to address CPU hardware vulnerabilities like Meltdown and Spectre. These may negatively impact load times or otherwise interfere with The Dark Mod. Right click "TheDarkMod.exe" choose "Properties", click the "Compatibility" tab and select Windows 7 from the dropdown list. This may not be representative of other graphic hardware and may be due to early Windows 8.1 driver support. Obsolete info. TDM v2.05 is compiled with the XP flag in MSVC 2013. Please refer to the main article TDM in Windows 2000 to work around this problem. Does it run in Linux? Does it run in 64 Bit Linux? Obsolete info. As of TDM 2.06 there are native x64 builds. Yes, Linux 64 bit is supported. In addition to the steps above, you need 32 bit compatibility libraries. On SuSE, they should be included. On Ubuntu/Kubuntu, install the package ia32. Yes. It's not "officially" supported (the team doesn't test it specifically), however several users have reported success running TDM under Gentoo. Obsolete info. As of TDM 2.06 Boost Libraries are no longer required. Yes. As of this writing you will need to install the libboost-filesystem package. If you receive an error about GLIBCXX_3.4.9, delete or rename the files /usr/local/games/doom3/libstdc++.so.6 and /usr/local/games/doom3/libgcc_s.so.1. If this doesn't resolve the error and you have an old version of GCC, then you may have to upgrade. It has been confirmed that, at least under Gentoo, GCC 4.1 does not work with TDM but GCC 4.3 and GCC 4.4 are compatible. Does it run on Mac OS X? Yes, but only for tdm 2.05. Does TDM support widescreen resolutions? Yes. Choose "16:9" or "16:10" in the in-game Settings menu, and select the appropriate resolution. Note that you need to restart the game to have the new setting in effect. If you get performance problems, please consider using a lower resolution and taking a look at Performance Tweaks. What about TV resolutions like 1360x768? Alternatively, see the manual of your TV on the possibility to switch it to a "1:1" pixel mapping, or "monitor mode" or "computer mode". Changing the screen resolution/aspect ratio does nothing!? These changes require a restart of Doom to work. Alternatively the command vid_restart can be issued at the console. It can take quite some time to execute this command, depending on whether or not you're already ingame. It will still be a lot faster than restarting and reloading the game though. If you have Nvidia hardware and Soft Shadows are enabled so too will r_useFBO be enabled. but you may choose custom scaling by disabling r_nvidiaOverride. either be used as a lower resolution input target or a higher resolution target for down-scaling. Windows 7 Aero desktop is known to make the screen too large in fullscreen mode. This can be remedied by setting Windows 7 Aero to Basic. This issue is discussed in more detail HERE. To begin the process, type sysdm.cpl in Run box (Windows + R) and hit Enter to open the System Properties. Select the Advanced tab and under Performance, click on Settings. In the Performance Options box, select the Visual Effects tab. Check "Adjust for Best Performance" then click Apply. Some users have reported that High DPI causes the same problem. Use these steps to disable it. Right Click on TheDarkMod.exe or your shortcut, go to the Compatibility Tab and check "Disable Display Scaling on High DPI settings"
Obsolete info. TDM 2.05 no longer makes the menus fuzzy when using image_downSize. Note: Disabling image_downsize options may lead to memory related errors. Obsolete info. TDM 2.07 has fixed this problem. This happens due to r_fboResolution scaling in TDM 2.06 (which is automatically on for Nvidia hardware when AA settings are used) for maps that use Portal Sky. Obsolete info. TDM 2.07 has fixed this. This issue was mostly seen for Nvidia users on 2.06 and is automatically addressed via the r_nvidiaOverride cvar. If you have this same symptom you may set r_useFBO 1 in the console or Darkmod.cfg for force Frame Buffer Object rendering. Note: If you use this workaround, in-game AA becomes "resolution scaling". We recommend you use FXAA or SSAA in your driver settings instead. From (at least) Catalyst versions 10.12 and beyond, the ability to disable Catalyst AI properly has been changed or removed. Rage3d and Guru3d have advised using "Radeon Pro" to address this. If you're using RadeonPro, create a profile for the game you want to disable Catalyst AI. Open Location on context-menu, this will open the profile's XML definition. Save the file and start the game. CatalystAI should be disabled. and look for "CatalystAI" entry, it must be equal to "1"
otherwise CatalystAI will be kept disabled after you exit your game. 1) Obtain a copy of the free "ATI Tray Tools" by Ray Adams from Guru3d. 2) Install it into your Windows tray. 4) Select Direct 3d -> Catalyst AI -> Off. Some owners of ATI graphics cards reported various artifacts when HDR-Lite Post-Processing was enabled. Among these artifacts are a distorted or upside-down screen and spinning sky. These can usually be fixed by disabling Catalyst AI, which also gives better loading times. To turn off Catalyst AI, open your Catalyst control panel, go to 'graphics' at the top left, select '3d' from the dropdown list and on the new menu below, select 'AI'. Now select the 'Disable Catalyst A.I.' checkbox. See HDR-Lite Post-Processing problems above. Also set "Multi-display/Mixed GPU acceleration" to "Single display performance mode"
Note: Newer Nvidia drivers seem to have cured these issues, and now the reverse issue was found by one user. It has been found that disabling Threaded Optimizations has dropped FPS from 60 to 25FPS. Catalyst Control Center above 10.8 for ATI cards has a performance slider for V-Synch. One report we had was for a Radeon ATI HD 4650, catalyst 10.9. This screen corruption as I understand it was heavy pixelation even on the menus. Closing down Xfire fixed it. "I fiddled with the xfire Doom 3 configuration through the xfire_games.ini, and determined it has to do with InGameFlags portion. For some reason the settings in that were interfering with doom 3, and after I removed some things from there, I was still able to run xfire, and doom 3 was still able to look proper." Please see the article about Performance Tweaks to improve the performance. The suggestions below are a quick summary of the basics. The game is very slow! 6) Set Ambient rendering to "Faster"
7) Set Interaction rendering to "Standard"
8) Set Object Detail to "Lowest"
Note: Lowering resolution may require disabling r_nvidiaOverride and r_useFBO. such as lowering 1080p to 1366x768 by setting r_fboResolution to 0.7115.
and it produces nasty artifacts for the texture scales we use. There is currently no benefit to enabling normal map compression so feel free to set this to 0. If that doesn't help, your system might not have enough memory. Beyond the above, you may need to kill background applications, increase your system RAM, or upgrade your GPU to one with 1GB or more of VRAM. Note: Many of the above changes can be made independently of each other so you may, for example, keep some quality options higher whilst reducing others based on preference and experimentation. Obsolete info. TDM 2.07 has fixed this issue. In v2.06, on Nvidia hardware, AA settings are really "Resolution Scaling" when Soft Shadows are enabled. As such, they will have a much greater impact on performance than in previous versions. We recommend disabling in-game AA and using FXAA or SSAA in your Nvidia driver settings. If you find an FM is very slow to load it may be an ATI graphics card problem. One report says this was cured by turning off Catalyst AI. Also cures HDR-Lite Post-Processing Problems. Changing the following settings to 0 will also reduce loading time, but be warned: if you have a lower-end system, poor graphics card, or low ram, you will likely notice a performance hit ingame since you will now be using uncompressed textures. There is no benefit to enabling normal map compression currently so feel free to set this to 0. The above must be wrong somehow because the default config is 1 if you set if to 0 you get sizable VRAM usage. NEWER INFO: As of TDM 2.05 the new "image_mipmapMode" cvar allows you to control whether mipmap generation happens in TDM or in your video drivers. Some people suffer from very low framerates underwater with HDR-Lite Post-Processing enabled. Currently, the only known fix to this problem is to set g_doubleVision to 0 in the console. This however disables the doubleVision effect completely, so that there is no underwater-blur any more. The murkiness still remains though. Note: This workaround will cause many fogged water types to become opaque. Disabling Post Processing is a better option at this time. Obsolete info. TDM 2.07 has improved Soft Shadow performance. In addition to AA issues, the Quality options in TDM 2.06 might be a bit misleading. significant softness is to increase quality which can be have a massive performance impact. 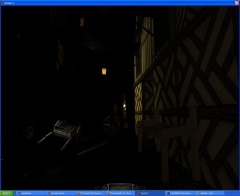 Instead, try increasing the "Radius" of lights via the r_softShadowsRadius cvar. Experiment with values between 1.5 and 3.5. It is hard to answer questions on why something fails, because wildly different systems cause wildly different symptoms. If the following section does not help you, please ask at our forums. For any solutions below that refer to "disabling Catalyst AI", if you discover you can not use ATI's tools to do so, alternate methods are discussed in Disable Catalyst AI in recent AMD ATI drivers below. Your system meets at least the minimum system specs. You have enough free main memory. Try closing a few running programs like Outlook, Anti-Virus or torrent clients. 2.06 Try the 32-bit executable. Some systems (primarily 32-bit ones...) may not launch the 64-bit one. The new Multi-Core optimization is unstable on some systems. Set com_smp 0 in your Darkmod.cfg to force this off prior to start. If that doesn't fix it, you probably receive an error message referencing an "Unknown event" at startup, like the screenshot below illustrates. Sometimes, the procedure fails due to spaces in the installation path. Try extracting the gamex86.dll manually using Winzip or similar or install Doom 3 in a different directory. You have a firewall installed that prevents the copy procedure, because since version 1.03, TDM has a built-in mission downloader. This misbehavior has been reported for the COMODO Firewall. It is also possible that an old version of gamex86.dll (or gamex86.so) is lying around in your Doom 3 folder. Delete it and try again. See the main article on tdm_update. The Windows update will crash at the "Applying Update" stage if the Darkmod folder is set to "read only". You fix it by right clicking on the folder, going to folder properties, and unchecking the box that says "read only" under folder attributes. If you are running Dark Mod under Linux and have edited the file darkmod/currentfm.txt this might prevent the FM from installing. This may be fixed in an update but apparently editing using notepad under Wine works OK.
You must not extract the pk4s or zip files but put them into the darkmod/fms folder (or alternatively you can create the FM folder in there eg, darkmod/fms/chalice for chalice.pk4 or chalice.zip. Early versions of Dark Mod cannot handle zip suffixes. Solution: rename to .pk4 or run tdm_update to get the latest version of Dark Mod. FMs (fan missions) are archives and in early versions of Dark Mod MUST be suffixed .pk4 not zip. Apparently Internet Explorer 8 may change it from pk4 to zip during download without telling you. You need to rename it back if running an early version of Dark Mod else run tdm_update to update and then zip files are OK.
Move the pk4 into the darkmod\fms folder if it is not already there. Delete the darkmod\fms\FMname folder if any, eg, darkmod\fms\chalice. Don't worry if there isn't one; it will be created automatically later. So all that is left is the pk4 in the fms folder. Now run TheDarkMod.exe. The FM should be in the list in the New Missions menu. Re-install it and you should now be able to play it. If you have previously set "s_force22kHz 1" to improve audio processing performance, this setting broken in 2.06 and will not allow you to load missions. This cvar does improve performance but it is not worth the hassle in most cases. We recommend disabling it (cm_backFaceCull "0" ) unless you know the mission you're playing has been tested with it enabled. Try disabling the AGP surface accelerator in DXDIAG. You either see black sky, or fragments of other textures. This seems only to happen on Geforce 6800 cards. to a different name. That will result in black sky. That should fix the sky and make it render correctly. This problem only affects FMs with a dynamic sky (eg, moving clouds etc.). If you see the sky spinning it may be an ATI graphics card problem. One report says this was cured by turning off Catalyst AI. Also gives better loading times and cures HDR-Lite Post-Processing Problems. * Create a new folder in your darkmod folder called materials. * Within it create a plain text file named no_skybox.mtr. Note: This may be obsolete as of TDM 2.06 as the EAX code has been replaced by EFX. A) "game freezes and loads some data from hard drive while opening doors"
B) "while loading mission you are returned to the menu and need to restart loading"
are often resolved by disabling EAX 4.0 HD in the Audio Settings menu. If your system does not provide OSS or a working OSS-emulation (try padsp ./tmdlauncher-linux), reset this to best which means ALSA. While OSS or ALSA deal directly with the sound hardware, PulseAudio is a soundserver that puts itself between the application (doom3) and ALSA. Your goal is to bypass the PA-part while playing TDM. You can either disable the PulseAudio daemon temporarily or connect Doom directly to ALSA. When sound playback fails, make sure you have s_driver set to best, and s_alsa_pcm to default. When it works, you propably want to adjust volume settings outside TDM. Try alsamixer (in a terminal). to dmargs.txt. If <name> is not convenient for you just try something like hw:1,0 if you know what you are doing, but be aware abstract designations like default will get "hijacked" by PA.
so the downsize changes can still be beneficial for larger missions on systems with less available memory. These will reduce the bumpmap size. Memory impact will be few hundred megabytes lower, at the expense of very minor blurring of texture quality. seta com_videoRam "512" (or however much video RAM you have). These will reduce all texture sizes. Memory impact will be much lower, but the graphics are visually pixelated, depending on the com_videoRam number. But at least the mission will be more likely run with systems with low RAM. ...to see if it still loads with better quality. A possible solution is to patch Doom3.exe with a 4GB Patcher to allow the game to allocate more memory, but the TheDarkMod.exe should already be using large memory space. Obsolete info. In 2.07 these values are saved when entered in the console. Some players get motion sickness or are otherwise uncomfortable with head bob.